Download "Forsyth Technical Community College 2100 Silas Creek Parkway Winston-Salem, NC 27103-5197. 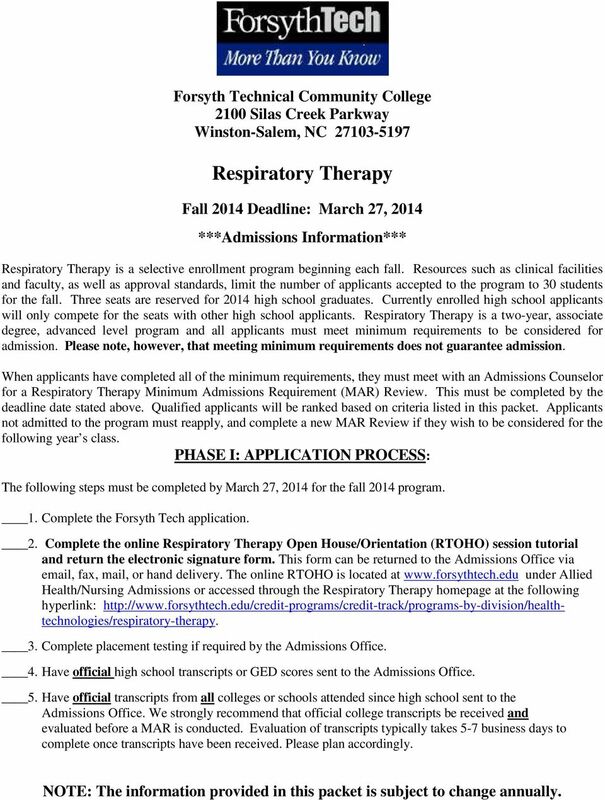 Respiratory Therapy"
1 Forsyth Technical Community College 2100 Silas Creek Parkway Winston-Salem, NC Respiratory Therapy Fall 2014 Deadline: March 27, 2014 ***Admissions Information*** Respiratory Therapy is a selective enrollment program beginning each fall. Resources such as clinical facilities and faculty, as well as approval standards, limit the number of applicants accepted to the program to 30 students for the fall. Three seats are reserved for 2014 high school graduates. Currently enrolled high school applicants will only compete for the seats with other high school applicants. Respiratory Therapy is a two-year, associate degree, advanced level program and all applicants must meet minimum requirements to be considered for admission. Please note, however, that meeting minimum requirements does not guarantee admission. When applicants have completed all of the minimum requirements, they must meet with an Admissions Counselor for a Respiratory Therapy Minimum Admissions Requirement (MAR) Review. This must be completed by the deadline date stated above. Qualified applicants will be ranked based on criteria listed in this packet. Applicants not admitted to the program must reapply, and complete a new MAR Review if they wish to be considered for the following year s class. 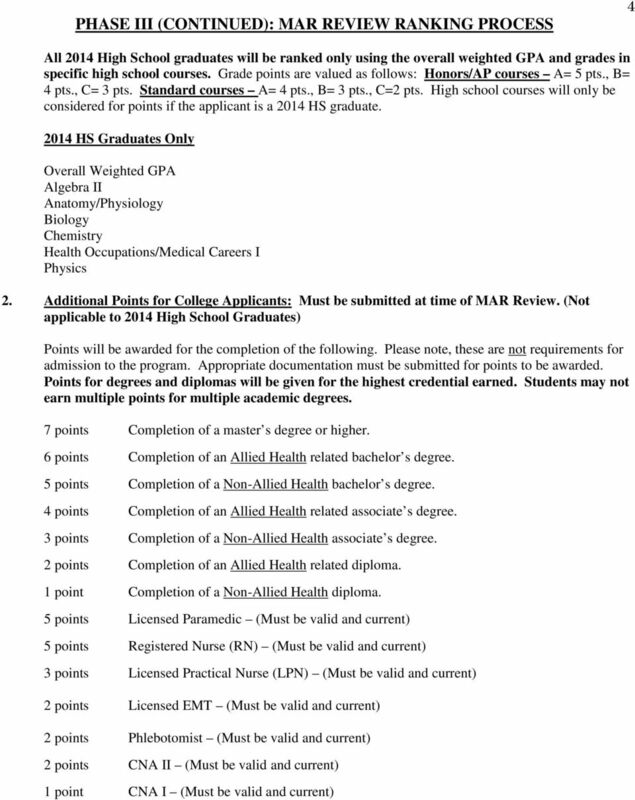 PHASE I: APPLICATION PROCESS: The following steps must be completed by March 27, 2014 for the fall 2014 program. 1. Complete the Forsyth Tech application. 2. Complete the online Respiratory Therapy Open House/Orientation (RTOHO) session tutorial and return the electronic signature form. This form can be returned to the Admissions Office via , fax, mail, or hand delivery. The online RTOHO is located at under Allied Health/Nursing Admissions or accessed through the Respiratory Therapy homepage at the following hyperlink: 3. Complete placement testing if required by the Admissions Office. 4. Have official high school transcripts or GED scores sent to the Admissions Office. 5. Have official transcripts from all colleges or schools attended since high school sent to the Admissions Office. We strongly recommend that official college transcripts be received and evaluated before a MAR is conducted. Evaluation of transcripts typically takes 5-7 business days to complete once transcripts have been received. Please plan accordingly. NOTE: The information provided in this packet is subject to change annually. 2 PHASE II: MINIMUM ADMISSIONS REQUIREMENTS 2 1. Placement Test Scores *CPT *COMPASS *ASSET Sentence Skills 86 Writing 70 Writing Skills 41 Reading Comp. 80 Reading 81 Reading Skills 41 Arithmetic 55 Pre-Algebra 47 Numerical Skills 41 Algebra 55 Algebra 46 Elem. Algebra 41 *These placement test scores are valid for 3 years. NEW FOR 2014: NC-DAP test. Applicants taking the new NC-DAP for math must demonstrate mastery through DMA 040. 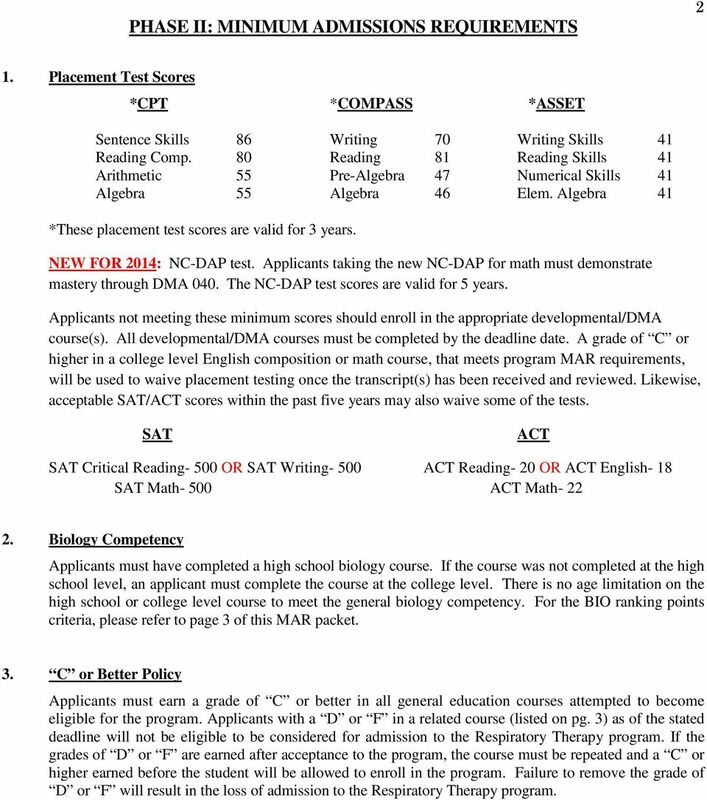 The NC-DAP test scores are valid for 5 years. Applicants not meeting these minimum scores should enroll in the appropriate developmental/dma course(s). All developmental/dma courses must be completed by the deadline date. A grade of C or higher in a college level English composition or math course, that meets program MAR requirements, will be used to waive placement testing once the transcript(s) has been received and reviewed. Likewise, acceptable SAT/ACT scores within the past five years may also waive some of the tests. SAT ACT SAT Critical Reading- 500 OR SAT Writing- 500 ACT Reading- 20 OR ACT English- 18 SAT Math- 500 ACT Math Biology Competency Applicants must have completed a high school biology course. If the course was not completed at the high school level, an applicant must complete the course at the college level. There is no age limitation on the high school or college level course to meet the general biology competency. For the BIO ranking points criteria, please refer to page 3 of this MAR packet. 3. C or Better Policy Applicants must earn a grade of C or better in all general education courses attempted to become eligible for the program. Applicants with a D or F in a related course (listed on pg. 3) as of the stated deadline will not be eligible to be considered for admission to the Respiratory Therapy program. If the grades of D or F are earned after acceptance to the program, the course must be repeated and a C or higher earned before the student will be allowed to enroll in the program. Failure to remove the grade of D or F will result in the loss of admission to the Respiratory Therapy program. 3 PHASE III: MINIMUM ADMISSIONS REQUIREMENT (MAR) REVIEW 3 After completion of Phase I and II, applicants are eligible to meet with an Admissions Counselor to complete the Minimum Admissions Requirements (MAR) Review. Applicants who wish to be considered for the fall 2014 program must complete the MAR Review between the dates of September 4, 2013 and the deadline of March 27, Applicants for the fall 2014 program will not be considered for admission until this step is completed. We strongly recommend that official college transcripts be received and evaluated before a MAR is conducted. Transcript evaluations typically take 5-7 business days to complete once received, please plan accordingly. The Admissions Office hours for the MAR Review are 8:00 a.m. 6:00 p.m. Monday through Thursday and 8:00 a.m. 2:00 p.m. Friday. The review is done on a walk-in basis and no appointment is necessary. Please note that MAR reviews will not be conducted during registration and holidays (October 9, November 4-30, December 16 January 10, January 20, and March 11). During fall break and spring break, MAR reviews will be conducted from 8:00 a.m. 4:00 p.m (October 7-8 and March 12-13). The Admissions Office is located in Allman room 123. 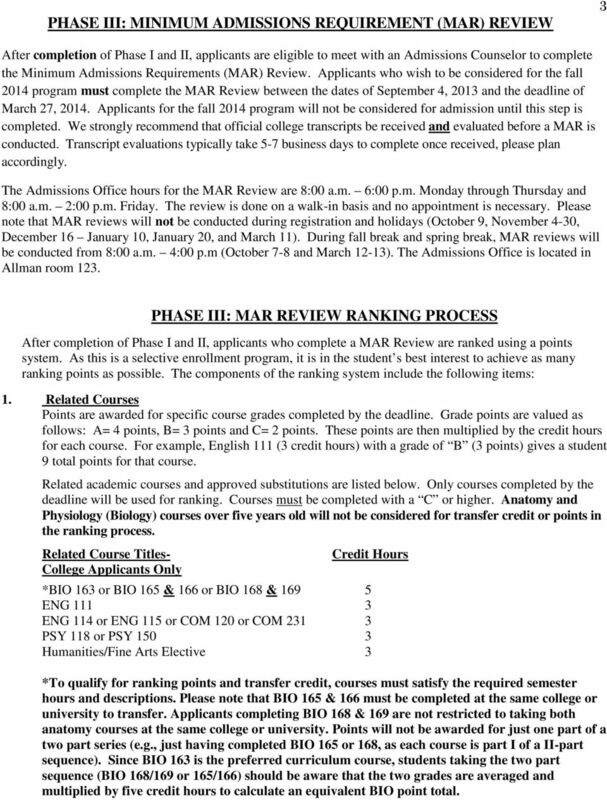 PHASE III: MAR REVIEW RANKING PROCESS After completion of Phase I and II, applicants who complete a MAR Review are ranked using a points system. As this is a selective enrollment program, it is in the student s best interest to achieve as many ranking points as possible. The components of the ranking system include the following items: 1. Related Courses Points are awarded for specific course grades completed by the deadline. Grade points are valued as follows: A= 4 points, B= 3 points and C= 2 points. These points are then multiplied by the credit hours for each course. For example, English 111 (3 credit hours) with a grade of B (3 points) gives a student 9 total points for that course. Related academic courses and approved substitutions are listed below. Only courses completed by the deadline will be used for ranking. Courses must be completed with a C or higher. Anatomy and Physiology (Biology) courses over five years old will not be considered for transfer credit or points in the ranking process. Related Course Titles- Credit Hours College Applicants Only *BIO 163 or BIO 165 & 166 or BIO 168 & ENG ENG 114 or ENG 115 or COM 120 or COM PSY 118 or PSY Humanities/Fine Arts Elective 3 *To qualify for ranking points and transfer credit, courses must satisfy the required semester hours and descriptions. Please note that BIO 165 & 166 must be completed at the same college or university to transfer. Applicants completing BIO 168 & 169 are not restricted to taking both anatomy courses at the same college or university. Points will not be awarded for just one part of a two part series (e.g., just having completed BIO 165 or 168, as each course is part I of a II-part sequence). Since BIO 163 is the preferred curriculum course, students taking the two part sequence (BIO 168/169 or 165/166) should be aware that the two grades are averaged and multiplied by five credit hours to calculate an equivalent BIO point total.